Treatment of osteoporosis in postmenopausal women to reduce the incidence of hip, vertebral & non‐vertebral fractures and to increase bone mineral density. Treatment of osteoporosis in men. Treatment of Paget’s disease of bone. Treatment and prevention of glucocorticoid‐induced osteoporosis. Prevention of clinical fractures in patients after hip fracture. Recommended dose is a single intravenous infusion of 5 mg Zoledronic Acid administered once a year. Adequate supplemental Calcium and Vitamin-D intake is important in women with osteoporosis if dietary intake is inadequate. Recommended dose is a single intravenous infusion of 5 mg Zoledronic Acid administered once a year. In patients with a recent low-trauma hip fracture, it is recommended to give the first Zoledronic Acid infusion two or more weeks after hip fracture repairs. It is also recommended to have a loading dose of 50,000 to 1, 25,000 IU of vitamin D given orally or via intramuscular route prior to the first administration of Zoledronic Acid solution for infusion. Supplemental Calcium and vitamin-D intake is Important in men with osteoporosis if dietary intake is inadequate. Recommended dose is a single intravenous infusion of 5 mg Zolenic administered once a year. Adequate supplemental Calcium and Vitamin-D intake is important in men with osteoporosis if dietary intake is inadequate. Recommended dose is a single intravenous infusion of 5 mg Zoledronic Acid administered once a year. Adequate supplement calcium and Vitamin-D intake is important in patients with osteoporosis if dietary intake is inadequate. Recommended dose is a single intravenous infusion of 5 mg Zoledronic Acid. Re-treatment with Zoledronic Acid may be considered in patients who have relapsed, based on increases in serum alkaline phosphatase, in patients who failed to achieve normalization of serum alkaline phosphatase, or in patients with symptoms, as dictated by medical practice 12 months after the initial dose. In patients with paget’s disease, adequate vitamin-D intake is recommended in association with Zoledronic Acid administration. In addition, it is strongly advised that adequate supplemental calcium corresponding to at least 500 mg elemental calcium twice daily is ensured in patients with paget’s disease for at least 10 days following Zoledronic Acid administration. BonizolTM should be administered intravenously via an infusion line, given at a constant infusion rate. The infusion time must not be less than 15 minutes. Patients with renal impairment:The use of Zoledronic Acid in patients with creatinine clearance <35 mL\min is not recommended due to limited clinical safety data in such patients. No dose adjustment is is necessary in patients with creatinine clearance >35 mL\min. No dose adjustment is required. However because decreased renal function occurs more common in the elderly, special care should be taken to monitor renal function. 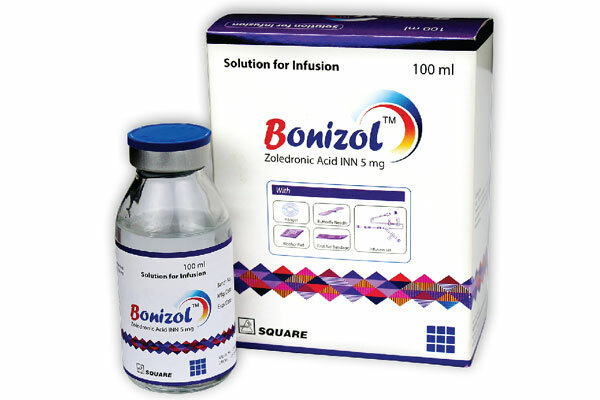 BonizolTM IV Infusion: Each pack contains a single 100 ml glass bottle containing Zoledronic Acid INN 5 mg. Hanger, Butterfly needle, Alcohol pad, First aid bandage, Infusion set is given in each pack.